Win one of 3 Mini Group Passes (2 adults & 3 kids) to Hanmer Springs Thermal Pools & Spa. COMMENTING BELOW with another family activity you’d like to do this summer. and/or TAG someone into the Facebook post (not mandatory but will earn you an extra entry). 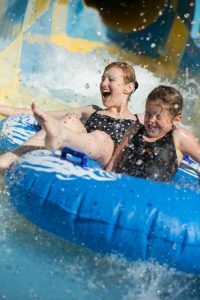 Like or follow ‘Kids On Board NZ’ and ‘Hanmer Springs’ on Facebook / Instagram to receive updates on other promotions and events for families this summer (not mandatory). For more information about Hanmer Springs please look at the listing here or check out their website here. The passes are valid for a single entry only. Children’s age is 3 – 15 years old. Under 3s are free. This competition is running from Thursday 8th December to Monday 12th December – extended to 12pm, with passes being posted as soon as contact is made with each winner. Mini golf is always a hit with the kids, along with an adventurous bike ride! I would love to take the family mini golfing these holiday while visiting hamner springs. Would love to win this for when we are in Hanmer Springs next weekend!! Our family is hanging out to head to Lake Aviemore over summer..so much fun. Fingers crossed for the win! Would love a trip to hamner over Xmas as wking all holidays and just want a quick get away with my kids. As a family we love to go fishing and exploring rock pools. we love going fishing at the beach, or down at lake tekapo way. Camping all the way! Our while family gets involved and we make a minice golf course, badmintin, darts, cricket, and lots of water play! We are spending Christmas Day in Hanmer and will be enjoying the beautiful pools and spending time with family. Margaret Mahy playground, Sumner beach, Hanmer pools, beach time in Golden Bay. Bring on the holidays! Super keen to throw the hubby and oldest son off the bungy in Hanmer! Victoria park in the dusk is awesome. Heading off to Blenheim / Marlborough for a family holiday exploring. We just moved home after 16yrs in sydney and really miss the kiwi summer! Go to Caroline bay carnival in timaru with kids – they love it! I’d love our family to visit the Margaret Mahy playground while on holiday during the Christmas break.